The PAMAS FastPatch 2 GO microscope system provides automated filter membrane particle counting and sizing. It was developed to comply with the standard ISO 4407, first instigated by BP to enable them to obtain visual-based reports confirming the cleanliness of critical fluids. The system is designed to measure the particles trapped on the surface of the filter. 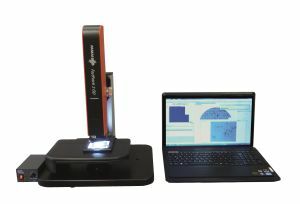 The method uses advanced image analysis and microscope automation techniques to provide rapid and accurate contamination results of whole or user specified areas of filters. The accurate and repeatable measuring results of the PAMAS FastPatch 2 GO are displayed in real time: providing a constantly updated particle count and contamination class results table. The clear and concise, user-defined end report displays the full patch analysis overview and the contamination classification table. The user can record images from any area of the filter membrane and add them to an end report detailing the size of each particle displayed. The PAMAS FastPatch 2 GO system complies with the international standard ISO 4407 and provides results to the following standards: SAE AS 4059, NAS 1638, ISO 4406 and ISO 16232. Automated particle count analysis system for filter membranes, including fixed magnification optical microsystem with integrated high definition camera. High resolution to see small particles. Intuitive user control including motorised X/Y staging with joystick. Optimised LED ringlight illumination with integrated polarising filter. The polarising filter can be switched on or off and enables visualisation of metallic / non-metallic particles. Automatic compensation for uneven surface and compensation for background colouration. Full correct filter patch result for non-uniform particle distribution. High performance laptop pre-configured with the analysis software. Compliance with international standard ISO 4407; reported to SAE AS 4059, NAS 1638, ISO 4406 or ISO 16232 standards. Patch scanning involves the process of vacuum filtration, which requires the use of a wide range of accessories. We will soon be updating this tab with the full list - please bear with us.